Kevin G. Loesch, O.D. is a native of Southern Ohio. He attended Centerville High School and then obtained a chemistry/biology degree from Eastern Kentucky University. He then went on to complete his optometric training at the Southern College of Optometry in Memphis, Tennessee. He is certified by the Board of Optometric Examiners in the Treatment and Management of Ocular Disease. 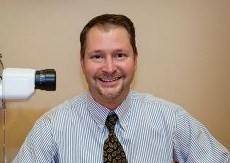 Dr. Loesch has been practicing in Northern Kentucky since 1993, and is a member of the American Optometric Association and the Kentucky Optometric Association. He lives with his wife, Kimberly, and their three children in Alexandria, Ky. He enjoys fishing and boating with his family both locally and at Lake Cumberland.